Home Match Analysis Tactical Preview Can Brighton keep Guardiola’s Manchester City quiet at Wembley? Wembley Stadium is set to host Brighton and Hove Albion and current Premier League champions Manchester City in the semi-final of the FA Cup. As Man City continue to fight on all fronts, they will surely have an eye on the first leg of the Champions League quarter final tie with Tottenham this coming Tuesday, whilst also looking to progress to another FA Cup final. Brighton meanwhile are busy establishing themselves as a solid Premier League outfit under the shrewd management of Chris Hughton, and their fans will no doubt be looking forward to a trip to Wembley. This game is testament to a forward-thinking club who have built a fantastic infrastructure as they look to stabilise themselves at the top level. Even the most casual observer would foresee this game in all likeliness resembling an attack vs defence exercise. Manchester City will hoard the ball and look to grind down an obdurate opponent. Brighton will look to have numbers behind the ball, protect their goal and look for the odd counter-attack without committing too many players forward at any given time. Set pieces could be crucial if they are to get something from the game, as well as the possibility of taking City all the way to penalty kicks. The problem Brighton face is that even a well constructed and executed game plan can still be ruthlessly exposed by the sheer abundance of quality City possess, organised so flawlessly by Pep Guardiola. In the fixture between the two sides last September, City strolled to a 2-0 win, a game which involved an interesting deployment of Oleksandr Zinchenko. Whilst the general flow of the game isn’t in doubt, there will be some interesting themes to look out for in this semi-final clash. 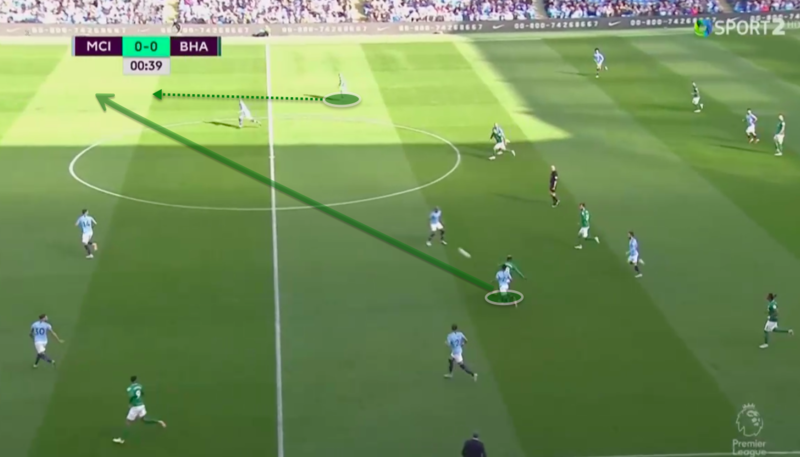 These will be the way in which Brighton set themselves up to defend, how they construct their counter-attacks, and how Manchester City will look to break down the deep block using their positional play. In the fixture between the two sides earlier this season, Brighton set up in a 4-5-1 low and compact block, and it is likely that Hughton will opt for the same shape at Wembley. With the five spread across midfield, this in theory limits the options for City to progress the ball with vertical passes, as well as switching the play towards the opposite winger as Sané and Sterling (if selected) will take up high and wide positions. The trade off of this system is that with both Brighton wingers being pinned back in the five across midfield, the lone striker has an almost impossible job of preventing City making easy progress in the buildup. It is very much inviting pressure, and this is very difficult to maintain against a team so adept at manipulating the opposition as City are. Hughton may opt for a 4-4-2 low block and use two forwards to screen the midfield and prevent easy progression for City in the build up, but this would open up the opportunity for City’s excellent switches of play to expose the opposite flank, and enable the likes of Leroy Sané to play one-on-one against a full-back. If Manchester City set up with their usual ‘free eights’ – probably a combination of David Silva, Kevin De Bruyne or Bernardo Silva, then how Brighton prevent them getting on the ball, usually in between the lines, is crucial. In the previous fixture, Brighton used Kayal and Yves Bissouma to man-mark both Bernardo and David Silva. Whilst this may seem an appropriate strategy in tightly marking two very dangerous players, notice how far apart both Kayal and Bissouma are dragged from each other in their duties, and the large central gap that has been created between them. With so many dangerous players all over the pitch, if Brighton do the same at Wembley, expect this type of gap to be filled and exploited. Man-marking strategies can easily be manipulated to open up spaces in advantageous areas. Brighton will not have much of the ball, and will probably not commit too many players forward on the counter-attack when they do win the ball. If they defend, as expected in a 4-5-1 with both wingers pinned back deep inside their own half, then committing numbers quickly forward will be very difficult. In the previous fixture this season, Hughton opted for Jürgen Locadia up front instead of Glenn Murray, presumably to use the Dutchman’s mobility and pace on the break. Murray is excellent in his hold up play and works tirelessly for his team, but in such an isolated role he will need runners off him and in support to construct an efficient counter-attack if he is preferred. There is a case that Hughton may opt for Locadia again in a similar role, whereby Brighton’s counter attack strategy is centred around long balls down the channels, or long switches of play in behind City’s full-back areas. Here Bissouma presses Sterling and recovers the ball. Instantly Bissouma then plays a long diagonal pass in behind Zinchenko for the pacy Anthony Knockaert to run on to, which eventually results in a corner for the Seagulls. It is perhaps not the most refined strategy, but it can be an effective one. By turning City around and running towards their own goal on transition, and trying to bring in their fast and direct runners and dribblers, they may cause City the occasional problem. It also means Brighton can keep as many players behind the ball as possible to maintain a level of security should the counter-attack break down. Bissouma, slowly establishing himself on the south coast, can be a key player in creating these situations, with his ability to win the ball and transition quickly. If he is able to win the ball in central areas, expect him to use his dribbling ability to evade the City counter-press and spring quick attacks. This is of course if he can evade the now notorious Manchester City tactical foul. Much has been written about Pep Guardiola’s positional play system, and City will once again set up in a familiar manner. The shape will likely be nominally a 4-3-3, with two high and wide wingers to stretch the pitch and open up inside pockets for the free eights to receive in between the lines. This setup means that should the opponents’ shape be drawn too narrow, then they can isolate their world-class wide players against full-backs. If however the opposition try to prevent the wide players receiving, then spaces in the inside channels open up for their world-class playmakers between the lines. 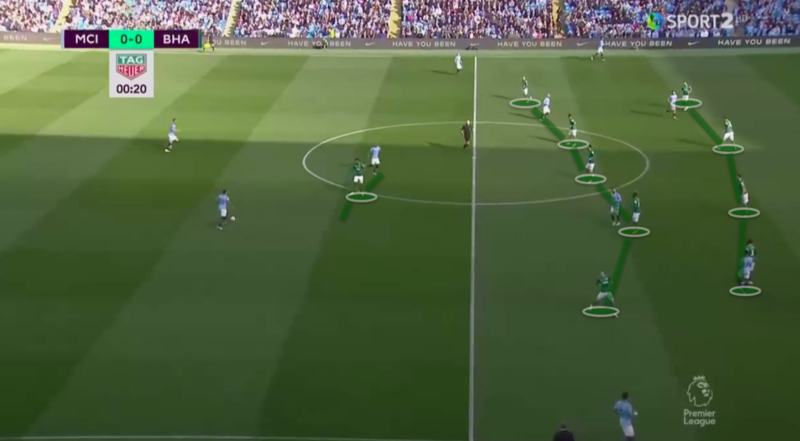 Expect to see a similar setup at Wembley, where Sterling and Sané take up high and wide positions, with the free eights taking up inside positions which attract the attention of multiple opposition markers. It will also be interesting to see whether Guardiola instructs his full-backs to take up similar narrow positions, as shown. Notice the triangle created between the false full-back Walker, Bernardo Silva as the number eight and Raheem Sterling as the winger; ideal for manipulating a deep block. This could be a common scenario at Wembley, and even a five-man midfield will find it difficult to prevent City from finding players inside the block or isolating their wingers against their full-backs. What will provide the most tactical interest of note in the game will surely be how Guardiola identifies Brighton’s defensive scheme, and adapts his players roles and positioning accordingly. 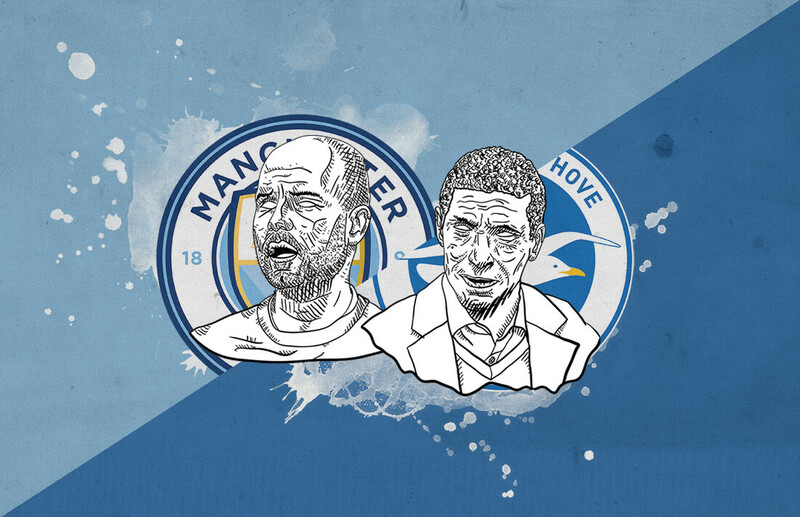 If Brighton choose to once again man-mark both City’s number eights, then Guardiola may instruct both players to use their movements to drag both man-markers out of position and open up passing lanes into Agüero, or even for the wide players to come in off the line and receive more centrally. Should Brighton opt for a more zonal approach, whereby the midfield unit shifts towards the ball to generate pressure and block off passing lanes, then expect Guardiola to ask his eights to be more rigid in their positioning in between the lines, and always looking to receive inside the block. It is hard to look beyond Manchester City to emerge victorious and book their place in the FA Cup Final in May. Not only do they have a deep squad full of quality, but they are so adept at finding holes in even the most stubborn of defences. They do however have to contend with a trip to London on Tuesday in the Champions League, as well as a title race that is going to the wire as they go toe to toe with Liverpool. If they were going to rest key players, or even take their eyes off the ball for a moment, then this game could perhaps be it. Even then, you would imagine Brighton would require a large dose of luck to progress to their first FA Cup Final since 1983. Tactically, whilst it won’t be one of the most entertaining spectacles of the season, coaches and analysts should pay attention to how Guardiola sets up his side to manipulate a deep lying block, and crucially how he adapts to how the opponent is set-up, to where he feels the spaces are to attack. With more and more games taking this pattern in the modern game, the techniques that Guardiola uses to beat low block teams are always worth examining. Brighton on the other hand may not be the sexiest football team to watch, but they are an example of a well drilled unit that understand their defensive roles and responsibilities, making opponents work for every inch on the field. It may be unspectacular, but Chris Hughton has shown himself as a highly competent coach, creating a tough to beat unit that plays within its means. It will most likely be City’s day, but don’t expect Brighton to roll over in the club’s biggest game of the season so far. If you love tactical analysis, then you’ll love the digital magazines from totalfootballanalysis.com – a guaranteed 100+ pages of pure tactical analysis covering topics from the Premier League, Serie A, La Liga, Bundesliga and many, many more. Pre-order your copy of the April issue for just ₤4.99 here, or even better sign up for a ₤50 annual membership (12 monthly issues plus the annual review) right here. Previous articleCan Barcelona seal another La Liga trophy with a victory over Atlético Madrid this weekend? Next articleWill Dortmund’s youth be the key in Der Klassiker? I'm Chris, a football coach and coach educator from London. Follow me on Twitter.